Hey Claire! My baby is two weeks old today! It's been amazing and challenging. Breastfeeding is one of the most difficult things I've ever done. My hormones are totally out of wack too! I read your blog some about babywise and I'm considering giving it a shot. The lactation specialist encouraged I feed by demand, but also use parent led to adjust it to work for me. I read babywise when I was pregnant and multiple other breastfeeding books, but now that I haven't slept, my brain is mush and I dont have a clue! Although it's getting better and when I started writing down when he was eating and how much, I realized he was setting his own schedule. Also because his birth weight was below five pounds, I really worry and stress about making sure he eats when he shows those signs of hunger. I'm totally a schedule person, but I don't understand how to establish it now, when and what that might mean I do differently because he is a premie. Did you talk with your pediatrician before trying babywise? Any advice you have or suggestions, I am willing to try different things until I learn what is going to work for me and my baby. Pumping and storage and all of that also overwhelms me at this point! And we went to all the classes the hospital offered! I can't read and process info when I'm feeling like this! Thanks! Yes, it IS overwhelming. I felt like a crazy person and trying to do things the 'right way' seemed almost impossible! And breastfeeding is a huge challenge. I never thought it would be such a hard adjustment. You are not alone! As for Babywise, I didn't ask my pediatrician about it. The nice thing about Babywise is that it gives you all the tools you need, but you can tailor them to fit your baby. One of my friends just had twins 8 weeks ago and she's doing Babywise. (They were preemies as well.) In the beginning she was feeding pretty much every 2-2.5 hours. Now they're just fine on a 3 hour schedule during the day. 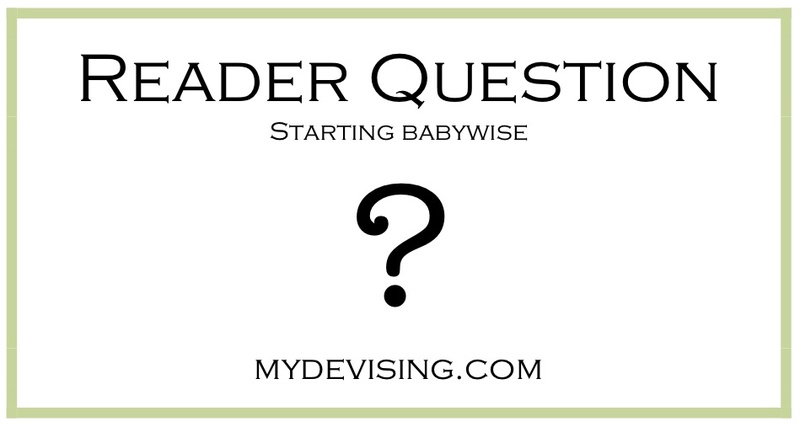 If I were you, I would definitely do Babywise. It's amazing how sleep-deprivation affects everything. The second I started Babywise, I noticed changes in Duke's schedule and ability to sleep longer. It saved my life! I have no idea what your current schedule is or how often you feed, but I would maybe try getting him on a 2.5 hr feeding schedule. If you notice he can go longer, then try 3. But maybe start with 2.5. Also, if you're not doing the eat/wake/sleep pattern, you may want to try it. And if you notice he's not as interested in eating every 2.5 hours or if you're having to constantly wake him from his naps to keep him on schedule, then maybe he's ready for a 3 hour schedule. I hope this is helpful and making sense! If not, or if you have more questions, please ask. I am certainly happy to help in any way I can. Even when you're crying, going crazy, ridiculously tired ... know that you're doing a great job! May I give a recommendation? From a preemie momma of two: don't feed on demand. Those early bird preemies tend to want to sleep more than feed. Be very intentional with feeding every 3 hours at least (stick with NICU schedule if he was in). He needs to eat more than term babies. I'm a baby wise, scheduled momma too. Just a recommendation: hold off on eat wake sleep until 2 weeks ish past due date. Preemies need to sleep to grow. Just as Claire said, A. You're doing great, B. schedule will help especially since you're a schedule girl. Thank you for your recommendations! I certainly don't know what life with a preemie is like, so thanks for chiming in. :) Love seeing pics of your boys on Facebook. They are SO precious.